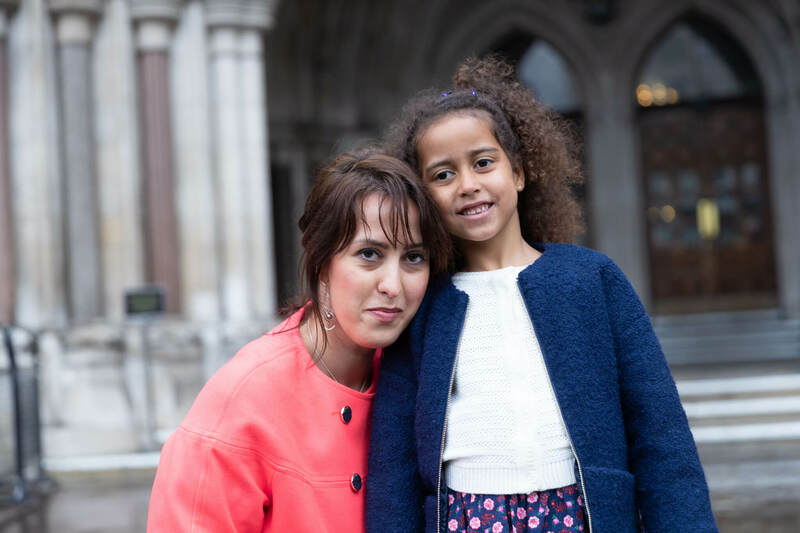 Alina Dulgheriu, a mother who was supported by a pro-life vigil outside a London abortion clinic, has filed a high court challenge to the Ealing censorship zone which criminalises prayer and support outside an abortion clinic. Alina was joined by others mother who had been supported outside abortion clinics at a press conference this morning outside the High Court. “I am here today because I have confidence in the truth. I am here today because I have confidence in the facts, and I have confidence in the British system of justice to distinguish spin from reality. And the reality is this. Without sufficient justification, Ealing council has decided to criminalise otherwise lawful behaviour…to criminalise charitable activity that is needed by some of the most vulnerable women in our society. I am asking that justice be done for those women who have been ignored by Ealing Council. I never imagined that I would need to take action at the High Court of the United Kingdom, a country famous for upholding the rights that make democracy flourish. I never expected a local council in the UK to make a decision that violates so many human rights; the right to free speech, the right to pray, the right to receive information and the right to assemble. As an immigrant who loves so many of your traditions, I never expected to have to defend the rights that keep a healthy British democracy alive. Ealing Council have helped Sister Supporter to ban, to criminalise, a point of view and a way of life with which they disagree. In doing so they didn’t even try to hide their bias, to the point of wearing Sister Supporter badges on the evening they voted on the PSPO. Those badge wearing councillors have in my view, bullied good, law-abiding people, out of public space they have a right to be in. They have excluded those who care for some of the most vulnerable women in society and do so without any expectation of reward. I know, because I benefited from their unconditional love. I urge people to read testimonies about this love, on the Be Here For Me Website. More importantly, Ealing Council didn’t have to criminalise us; they chose to. Despite over 20 years of vigils operating peacefully without a single arrest, and despite a great relationship with the local police, the cabinet chose the most extreme option available to them, and removed vigils entirely. The council could have used existing powers that protect the vulnerable and keep peaceful vigils in place. Instead, they are using a sledgehammer to crack a nut… a nut that does not exist. Ealing Council has publicly accepted that vulnerable women want and need the help of pro-life vigils, yet, they chose to remove that help. They have knowingly removed help for the most vulnerable…. the physically abused…. immigrants, often with language difficulties. Many are not able to access benefits, and those who are abandoned by everybody else in their lives when they get pregnant. I cannot put into words the joy, the beauty and the love that my daughter has brought to my life. She would not be with us today if it weren’t for the vigils that Ealing Council has criminalised. I refuse to accept that other women who want to keep their child should be cast aside. I refuse to accept that women should be punished for not finding the support they need, before they get the abortion centre. I know I speak for thousands when I say: I will not let those women be punished, and I will not let those women be cast aside. “My daughter means the whole world to me. I am so grateful to have been given the chance to be her mother. If I had not met, outside the abortion centre, the person who offered me the real help I desperately needed she would not be with me today. A terrible thought! It is very upsetting to know that Ealing Council have banned the offer of help that changed my life. They have made it illegal to help women like me. How is it respectful of a woman’s choice to hide from her the help that she desperately wants and needs? How can people who call themselves ‘pro choice’ take away our choices? Ealing council want women like us to have only one choice: abortion. Even if that is not what we want at all. “Two weeks ago, Ealing council voted to ban people from offering help to women entering Marie Stopes in Ealing. For over 20 years there has been a peaceful vigil there, but recently a group of activists has decided that they object to this pro-life witness. The local MP and Labour councillors agreed, so a highly biased consultation exercise took place. There are thousands of pages of witness statements, but the council deemed that a certain group of women didn’t need to be consulted. Over 500 women have accepted help from the vigil in Ealing over the past five years. They are literally the most marginalised and ignored group there is. They have tried to speak to the council several times but the council ignore them. Council officials didn’t interview them for the report. Pro-choice activists say they don’t exist. At a rally outside the Town Hall, they tried to shout them down, and drown out their stories. “I am an Ealing resident and I support the charitable outreach that has for 23 years, peacefully & lawfully, helped many hundreds of women on Mattock Lane to make a choice that they wanted, rather than one that was thrust upon them. The campaign to criminalise the offer of help to women who have no other form of support has been the fruit of a close collaboration between abortion activists, abortion providers and Ealing Council. Untested assertions, which appear to have principally been gathered after the anti-vigil campaign was underway, have been uncritically accepted & repeated again and again by councillors, the media and even our local MP. Lurid stories of harassment and other wicked behaviours have all been unjustly attributed to members of the wholly peaceful vigil. This has had the entirely predictable effect of stoking public disapproval of innocent people who are wholly decent and benign. This has been shockingly irresponsible on the part of Ealing council. These unfounded assertions have been used to justify a PSPO which is draconian, illiberal & entirely unnecessary. The imposition of this ban utterly perverts the much touted principle of ‘choice’. It is inimical to civil rights and sets a dangerous precedent. Surely even a pro choice person can see that denying the offer of help to women who have none is a profoundly anti choice move. High resolution photos and video of the mothers speaking at the press conference are available here – https://www.flickr.com/photos/153780803@N08/albums https://www.youtube.com/channel/UCVQ1LKpPkJzEyK5xEZ-5iRQ/videos. The Be Here For Me campaign launch video is available here (https://www.youtube.com/channel/UCVQ1LKpPkJzEyK5xEZ-5iRQ/) to use for embedding and is available for re-use in media articles. Please contact us for access to original files. To arrange a media interview with one of the campaign’s spokespeople, please contact info@behereforme.org or phone 074 2701 8218.